Short stories or poems about ships, boats, boating, rescues and lifeboats, possibly educational, usually interesting. A Grand Day. lifeboat story. A family story with rescue, adventure and powerboat boat techniques. The long walk home - Louisa’s way. A moonlit walk across the moors. then go to Louisa Lifeboat Lynmouth. January storm back in 1899. 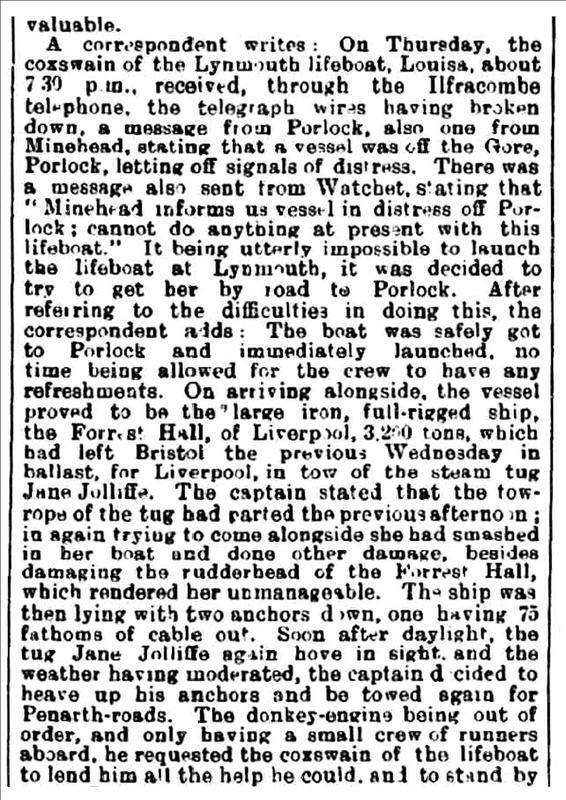 ​ Lynmouth Lifeboat Louisa and the rescue of Forrest Hall in January 1899. One stormy night - we watched them go. . .
into a moonless, storm driven winter adventure. Set close by the seashore, nestling below hills that rise steeply to bleak moorland, is Lynmouth and home. The road to the east is no more than a narrow mud and stone track with an unguarded drop on one side to the sea below, fit for cart horses and an occasional coach. The tiny harbour floods twice daily under one of the highest tides in the world and all this day long the village has been relentlessly battered and soaked by a north westerly gale. In the lamp light of the tiny post office, the telegraph clatters urgently into action before falling silent, another victim to the storm. The postmaster holds the ominous message with trembling hands. It’s a call for help – a ship in distress and a desperate crew in need of aid. No other boat along that coast is located better for a launch than the Louisa. Despite the roar of sea and wind, the unmistakeable boom of a signal rocket shakes the air above the village, a sudden flash of light illuminates the empty streets. Like everyone else, you run to the boat house, eyes half closed against the driving rain. The maroon summons the village to action, the crew needs help to launch. With a fierce wind tearing at your already soaked clothes, you stop in horror, shocked by the impossibility facing the crew. 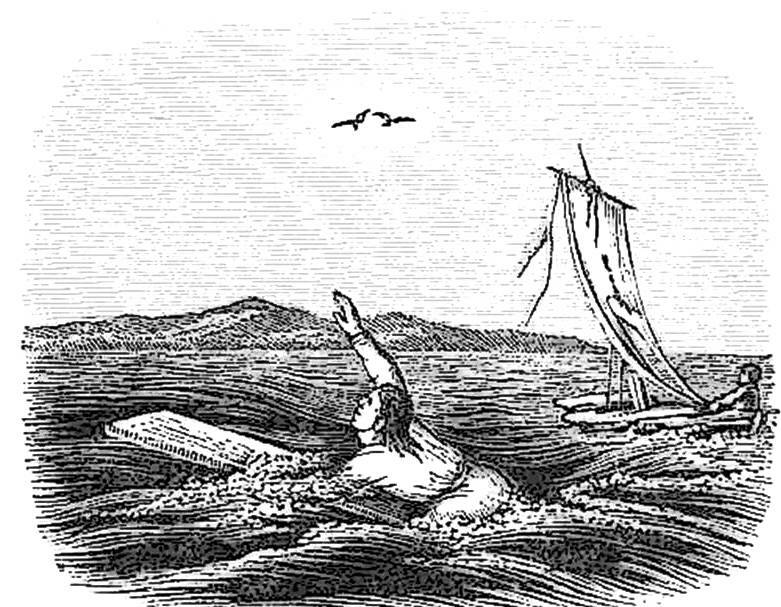 Great waves carry rocks from the beach and crash into the street over the low harbour wall; neither man nor beast could ever survive a launch in such a maelstrom. You join the crowd in the boathouse, aware of the warmth of shelter so cruelly denied to those now lost out at sea. Your father is among the chosen crew, you see a tear in his eye, you have never seen this before, he is your hero and many a time has set out to sea risking all for strangers in need. But tonight is different, tonight they are helpless. Through an open doorway you turn to look seawards, far away through the spray and gloom you watch, as a distant distress rocket falls to its own untimely death. What can be done? How can they, brave men all, stand idly by while their fellows drown, the shame, the helplessness? These men know the sea and know the risks yet duty and honour runs like the blood in their veins. It is a long way. You know full well their first obstacle, for on a fine summer day, you’ve climbed Countisbury Hill on the east bound track yourself. Without any burden, it still took you nearly an hour. Beyond Countisbury, lies eleven miles of unrelenting, exposed moor and the infamous hill that twists its tortuous way down to Porlock. Only then, can the exhausted crew of Louisa attempt a launch and row out with already blistered hands and aching backs to search an unknown darkness in Porlock Bay. You are not alone in thinking it impossible, but that is their choice; certain death or the impossible. They choose the latter. The call quickly went up for horses, ropes and lanterns and even the doubters became inspired. Men, women and children scurry to prepare the lifeboat for its journey. Many of them, along with the horses, climb that hill, stumbling painfully, hauling and heaving as their feet slip and slide on mud and stones. 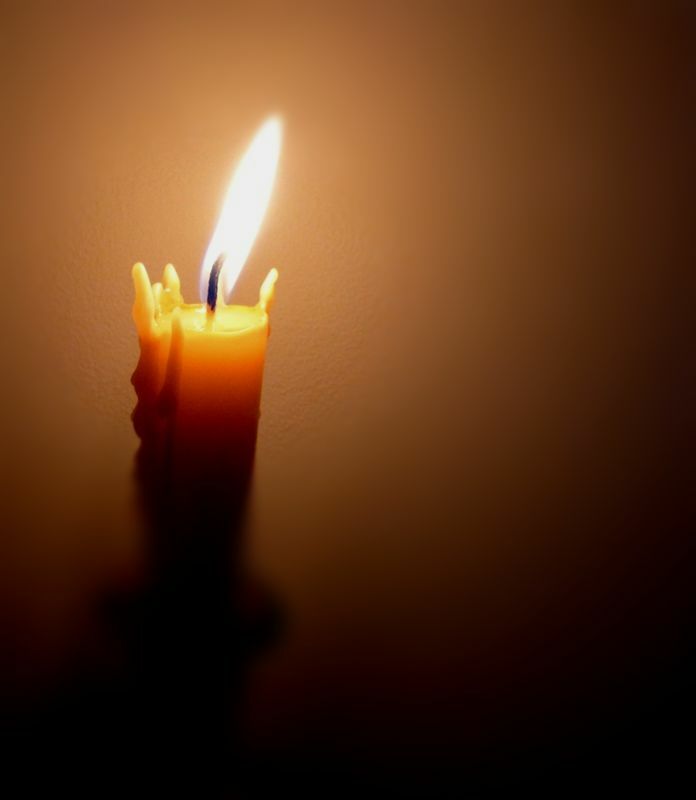 The wind extinguishes already dim lanterns, almost impossible to re-light in the gusts and rain. The rain turns to sleet, the cold increases. Even in such cold, they sweat, a sweat that cools rapidly should they rest for even a few moments, chilling the body to the bone. They disappeared from sight after about an hour; just a faint twinkling of a dim lantern in the far darkness before nothing but blackness remained. We know not, if everyone will make their way back home safely and of those who do, they will be changed forever. It will be a long wait. We, who did not take this amazing journey, will never understand nor dream of what, they who went, endured. The pain of cold is not felt by reading words, nor is the sadness of slipping harness from a dead horse, dying for the cause, its body unceremoniously dragged to one side, because other things now matter more. Through the long hours of night and through the next day we wait, not knowing who of family and friend will return. Shoulder to shoulder, we will wait together, you and I. We will prevail, it’s what we do. Maurice Livingstone stands on the cliff top looking out to sea. ​In the background the ruins of the 13th century abbey stand out against the cloudless blue sky. The sea is calm today, in the distance a few ‘white horses’ on the caps of the waves dancing in the sunlight. The fishing boats are moored in the harbour, their work done for the day, their catches sold and sent on their way. The lobster pots are still out though, marked by brightly coloured buoys ready to be picked up later. Lobsters and crabs are a speciality here. He watches as families set up their windbreaks on the beach, settle in their chairs and store their cool boxes full of food and drink. Children dance in and out of the waves gently breaking on the sand. Bandy-legged babies totter down to the water’s edge to fill their buckets before they toddle back to the castles their dads and older brothers and sisters have built in the already wet sand. Further along, the rock pools are alive with the more active, armed with nets and buckets, searching for creatures hiding deep within the crevices of the stones and buried in the sand. The sun is hot, there is scarcely any breeze, a perfect day for the beach. 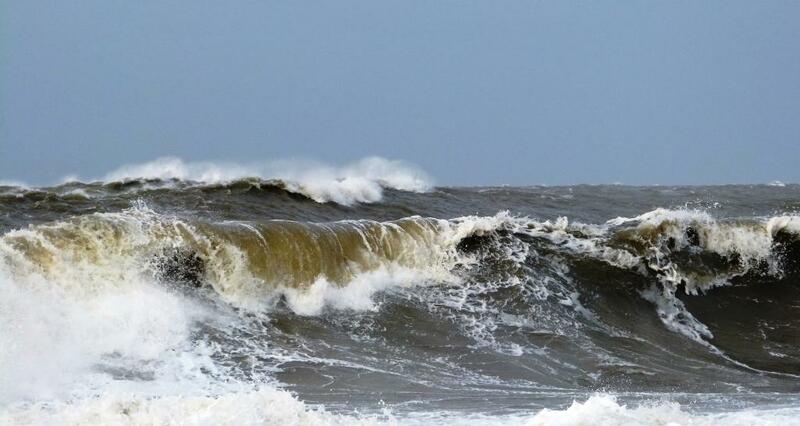 It is hard to visualize how the sea, so calm and safe today, can change to raging and dangerous. Maurice closes his eyes and remembers another day, when the skies were dark and the sea was lashing around the pier. Waves as high as a house, and a yacht with four of his friends from the city, who thought they knew it all, on board. Weekend sailors who had ventured out of the calm waters of the port into the wild North Sea, ignoring warnings from the harbour master, their precious boat now smashed on the unforgiving rocks. He remembers watching as the lifeboat, only yards from the shore, lifted to almost 90 degrees on top of the waves. The brave oilskin-clad volunteers so close you could see their faces, risking their own lives to save the men who had been thrown from the wrecked boat. Maurice had been on the beach that day, just passing the time until they returned, those four friends. He had watched the rolling waves engulfing the sand bit by bit. He didn't often get to the coast, he didn't have the time. But this weekend had been special. Jeff from the office had invited a few of what he liked to call his 'mates' for a trip out on his newly acquired boat. It wasn't much, he'd insisted, just a little twenty footer, but it was good fun and there'd be a few beers. Maurice felt he had to go on the trip, didn't want to seem a spoilsport, but he and the sea didn't really agree. Still, he'd give it a go, didn't want to fall out with the 'mates'. But he had felt so ill on the morning of the outing, probably something he'd eaten, he'd never really trusted seafood, that he'd made his excuses. This probably saved his life. He'd heard the boom signalling the lifeboat, he'd witnessed the rescue attempts, he'd seen two men plucked from the sea by a couple of policemen who had waded into the swirling mass at the breakwater, only yards from the shore. Brave men, or maybe stupid, but they had saved the lives of Jeff and one of his 'mates'. Roy and Duncan weren't so lucky. Barbara is a published author, an active member of a writing group and a welcome guest to these pages. For a misty autumn evening the bar was surprisingly full and little groups of happy revellers were scattered through the long bar of the Blue Ball Inn at Countisbury. The log fires were hard at work keeping the sea cliff damp at bay and the landlord took a moment to enjoy conversation with some regulars. Often, the conversation centred on the ‘Louisa’, a lifeboat used in an epic rescue on a gale torn January way back in 1899 and now talk was of a motion picture being made of the event. Over a century ago, the Blue Ball Inn had played its part that fateful night as host to the gallant souls of Lynmouth as they crested the one in four hill with their ten ton load. Sometimes the wind so strong it snuffed out their hurricane lamps. The landlord was so absorbed by the collective excitement that it took him a while to notice a customer sitting alone at the end of the bar. The customer was a stocky, elderly gentleman, a man of the sea by the look of his complexion and gnarled hands, his bushy white beard as much covered in sea mist as was his old brown duffle coat. There was something, ask anyone who was there, they’ll tell you, there was something in his voice, his tone, his accent and yet something else too that commanded hush in the bar. Customers turned their chairs; the landlord leaned forward on the bar and the old man began. . .
‘Some few years past now, engulfed in a cold mid December, the little fishing village was entombed in a deathly dark and stormy night; a heavy fist thumped hard on the coxswain’s cottage door; and thumped again, ‘twas mostly drowned out by clattering rain and howling wind . . . the sea roared like the thunder that filled the skies. The coxswain, he was well respected in the village and popularly known as ‘old Bob’, was not a man to dilly dally, and in his heart of hearts he’d had a feeling this would happen. His door soon opened, spilling light into the foreboding gloom and there it fell on the rain drenched faces of two … no … three men. A stabbing flash of lightning reflected brightly off the rain lashed cobbles and lit up an old stray dog cowering in the half shelter of some cottage steps. The village seemed deserted, windows closed and shuttered against the relentless rain. They were soon at the station; breathless they went about their tasks in silence, each knew what they must do. Lights flickered on all over the station, the radio crackled into life, and the coxswain went to look at the slipway – now almost hidden by crashing waves. “Not enough crew”, he shouted, “get a maroon off!”, and under his breath muttered, “and God help us too”. He’d never seen such a raging sea this side of the sand bar before. He knew his duty, as had his late father, he must try and save the terrified souls on the stricken yacht, but, as the mighty thud of the maroon shook the night sky and awoke the village, he knew he could be sending men, good men, to their deaths. With the odd tweak of their waterproofs to make them comfortable, if that could ever be possible, they gathered at the stern of their stalwart old lifeboat. “Right lads”, shouted the coxswain, “I don’t need to tell you what this storm means to those who are out in it, but I’m not picking the crew tonight; Volunteers only this trip.” To a man they all stepped forward. Old Bob knew they must be afeared, for so was he, only an idiot would have no fear of a cruel raging sea like tonight’s. He felt immense pride in his comrades, but this was a time for clear thinking, not emotion. Old Bob stepped forward and placing a strong hand on one man’s shoulder he said “not you lad, not you … you stay at station ... look after everything for our return”. The man, father of three young boys, was filled with guilt that he was not to go, but knew the coxswain’s word was law, and how happy his wife would be that he had not gone to sea – like any of the crew’s families would have been that night; that night of all. Six men manned the lifeboat that fateful night and all six doubted that they’d see the morrow’s dawn as the aptly named ‘Princess Dauntless’ ran down the slip just as fast as a big wave came in to meet her. It was one mighty breath taking crash, every one lurched forward, there’d be a few bruises later if they survived, the wave seemed to swallow the boat whole. The Coxswain gunned the powerful diesel engines …. He must clear the slip and surrounding rocks before the next wave hit and pushed them back. They were away yes, but only God knew how they would ever return. The young family man, spared by old Bob, was joined by four or five others who had braved the storm. A storm which was now occasionally hurling swathes of hand numbing sleet at the village; temperatures were tumbling. The volunteers busied themselves, there would be little sleep that night, wet clothes went to the drying room, floors were mopped, doors closed and VHF radio set on the emergency coast guard channel. Someone put the big kettle on the gas and set some chunky white mugs out on the table … extra mugs were lined up for the returning crew. How long those mugs were to sit there waiting no one could ever tell. They were lined up in view of the sea through the upstairs window as if waiting; if mugs had feelings then they waited with stoic patience and hope. 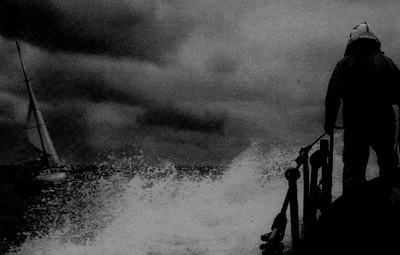 While the base crew were warm and safe in a station that was built strong to withstand a storm of the century, the lifeboat crew and their boat were taking a beating from breaking waves as they closed on the sand bar, they were truly in a storm of the century, a cutting wind drove sleet and heavy sea spray into the strained faces of the deck crew as they struggled to see any sign of the stricken yacht or its crew. “No sign skip, no sign yet”, shouted one of the crew above the gruff roar of the sea, the howl of the wind and the racing diesel engines. Often on a trip out to an incident the crew would have time to reflect on life and chat to each other – not so this time – every breath, every heartbeat, every cell of their bodies were focussed on each and every eventful moment as it came rushing from a darkened nowhere and raced by them, as did the rushing sea, into a more darkening past. The next moment could be their last – they were in the firm grip of a merciless storm. In the cabin the coxswain’s second in command wrestled with compass, charts and clock as he desperately tried to keep track of position. While still too much dark cold sea washed over the decks the coxswain also wrestled, not only with the wheel trying to read the waves, but he wrestled with his conscience. Old Bob felt for the deck hands, and allowed himself a moment to wonder if he’d made the right decision. They were all facing death out there and still no sign of the stricken vessel; had she sunk? Was she even really out there? How much longer could they stand this punishment? How would they communicate – coastguard had confirmed this yacht had no radio. Then, just as they crested a wave, there, in the trough, there she was, lit up by the powerful search lights from the lifeboat, there she was; About a forty footer, sails tattered and with lines and rigging not only strewn on deck but trailing into the sea; No lights showing, no sign of life, the powerful floods and search lights from ‘Princess Dauntless’ scoured every visible inch of the heaving yacht – they saw nothing. 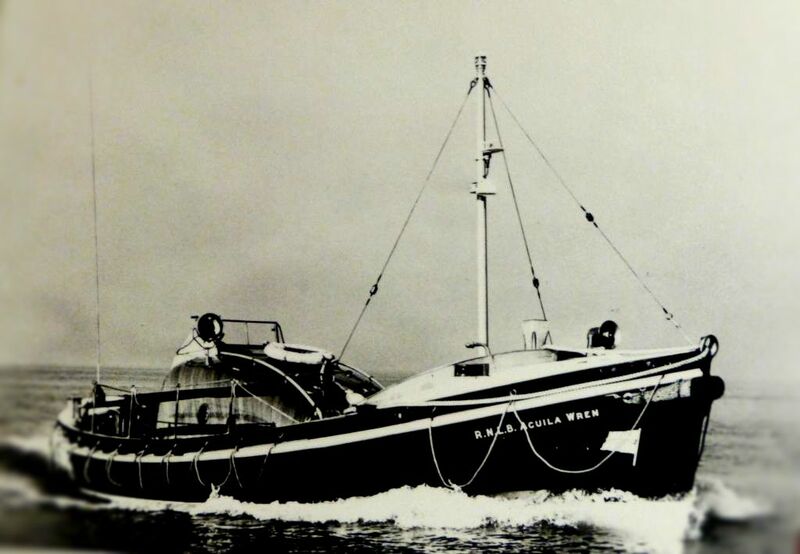 With one eye on the moving sea and the other on the tortured yacht, old Bob came alongside as close as he dared; tough as it was their lifeboat could still be damaged and debris in the water choke her engines; no other boats covered this area and with air-sea rescue helicopters grounded – any rescue was up to them – just a handful of men and their ‘dauntless’ vessel. “No sign of life – no response”, shouts a crew member through the open cabin door. 'Damn, damn, damn,' thought the coxswain, 'as if it wasn't bad enough'. It was one thing to risk life to save life but here they could risk all to find no one on board. Finding a body in this maelstrom of a sea would be without hope or sense, they would be lost for sure. 'Damn, damn, damn', he thought, and while he fought the sea from the wheel he called most of the crew to the inboard cabin, leaving only the searchlight crew up top. As they gathered, soaked, tired and battered, the Coxswain, always tenacious to the last, said, “One last chance lads, one last chance .... we'll board her, search her, and if no luck we'll head up coast and look for shelter. ...... You know I don't like asking you, but, we need a volunteer, we need someone agile, young and strong.” They all, to a man, turned to look at Dave's son, Jim, no doubt the strongest among them. Jim sensed there was no escape from this, better to volunteer, that's after all what they did; put their lives on the line to protect others from the perils of the sea. “What's the plan? I'll go,” Jim said, clearly and calmly. A couple of good slaps on the back from the crew and the Coxswain explained, “Be on the port beam, I'll come alongside her from above as we drop down a trough, ... you'll not have long but you should be able to drop on to her deck. As soon as you’ve gone I'll pull away and hold off. We'll pick you up the same way but we'll come in beneath the yacht and on our starboard side. We'll watch for you all the time, the deep shall not have you. A couple of you go with him to help safely clear the rail. If it looks impossible ... well ...” his voice trailed off, there was nothing left to say really. As the coxswain began to ease the lifeboat into position, he caught a glimpse of the boarding crew through the port side window, they struggled for balance on the heaving deck and were buffeted by the wind, but he could see they were ready and clipped to their safety lines. At last the right sort of wave came along, fairly clean it was and big, and, like toys moved by a child's hand, he put 'Princess Dauntless' alongside with but a foot between them. He saw Jim launch himself beyond the safety rail and then could see no more, with a deft touch he pulled away from the stricken vessel. There was a thumbs up from the deck crew and he knew Jim had made it. The deck crew watched intently as Jim gamely fought his way to the rear hatch of the listing yacht, twice he disappeared from sight, the tension unbearable, and then they could see his lamp moving about inside the cabin. A breaking wave nearly rolled the yacht right over but she recovered, it seemed like forever, one wave came and then another, breaking more frequently now as they closed on more shallows. There was another glimpse of the brave Jim at the fore cabin and then again, nothing. It seemed a lifetime was passing by and hope was fading, but suddenly Jim was up on deck signalling that the vessel was empty ... no one on board. Now they started the struggle to claw him back. “Jim says its all clear, and he wants to go home!” came the shout into the coxswain's ears. He took a moment to glance over his shoulder and with a smile shouted back, “Stand to then, and let’s go fetch him”. As Jim found a vantage point on the stricken yacht he breathed a sigh of relief ..... at last he was out in the open air and not in a floating coffin where half the time he didn't know which way was up. He had stumbled and fell the length of the yacht, in places water up to his boots, in places up to his neck, there was no sign of life but he'd looked for a body too; he had groped and floundered in the dark water for anything human but only come up with a number of cushions and clothing. He was glad he was out .... “Now, where's my lift home” he muttered through shivering lips. The yacht teetered on the crest of a wave, rolled a little then started to drop down, beam on, .... his heart skipped a beat ... there in the surrounding darkness, a bright jewel of hope, there she was moving in below ... beautiful to see .... 'Princess Dauntless', with all deck lights bright and deck crew waving, Jim could see two comrades ready by the safety rail they had prepared. His comrades stood ready to catch him, come what may. It was looking good, he prepared to jump, but the sea was not finished with him yet, just as Jim committed his body to that leap of faith the crest of the wave had broken, dropping heavily on to the yacht; the yacht listed sharply away from the lifeboat and Jim missed his footing, his desperate fingers clawed at the lifeboat's safety line and his comrades were quickly on him with strong hands to draw him to safety. First he felt their determined power as they began like giants to heave him on board... then he felt the sickening pain as the yacht rolled back and crushed one leg between the boats. The Coxswain heard the scream both in his ears and in his heart; a gap appeared between the boats and Jim's semi conscious body was dragged unceremoniously into the cabin. The coxswain cleared the sinking yacht, called for a bearing for the estuary and fixed his eyes, body and soul on the sea ahead; he must get these lads home. An hour later, they were in the sheltered and calmer waters of the river, on shore they were welcomed by an ambulance's blue lights. The crew did their best first aid but by the look of the leg it was not going to be a comfortable transfer. “You'll be ok' ... ' see you at the station' .... 'see you in the pub', came the farewells from the crew. It was a good few long months before Jim was back in the village, his dad drove him down to the station, but he was determined to walk in unaided. He limped in to the familiar faces of all his comrades, picking up on some trivial banter on the way … ‘ Oy, Jim, when you gonna bring them waterproofs back?’ …… … ‘All right for some, we have to work for a living’ … but there, sure enough, on the table was his mug ... “come on “, said the Coxswain, “let’s fill this up with something stronger than tea!” As Jim moved forward to pick up his mug he saw next to it was a little blue box ... “that's yours”, shouted one of the crew. Jim picked it up, carefully he opened the hinged lid, and there nestling on velvet was a Silver medal, he read the words to himself, it simply said ‘For Gallantry’. Tea, banter and a little rum flowed and they celebrated Jim’s final return from that little adventure they had shared and endured; they were all back together, comrades all. While such men live there can be no end to this story. The old man stopped talking; knocked back the remainder of his rum, wiped his lips on his coat sleeve and placed the glass reverently on the bar. For a moment there was a hushed silence then loud applause and a few shouts of ‘well done’ and ‘good on you’ filled the Inn. The customers turned to each other busily talking over the story and about who their visitor might have been . . . “Was he a lifeboat man himself? Was he a fisherman, or sailor? Where’d he live? Where’d he get the story? Was he one of the crew? And so it went on. The landlord looked at the rack of spirits, selected a bottle and poured out a fine double rum, “Have this one on the house,” he said turning to wish the old gent well, but he was no where to be seen. He’d gone, slipped quietly and as secretively into the darkness from whence he’d come. The landlord looked at the untouched rum still standing on the bar where the old gent had sat. . . “Strange things do happen here for sure,” he thought, “strange things indeed”. It was a grand day, indeed a very grand day and they all three lifeboat men were in good spirits as they tucked in to a hearty English breakfast and looked out through the cottage window across the bay to a rose hued sunrise. All was well; they were set up fine for their journey home far across the water; a feeling of expectant excitement pervaded their very beings, it certainly was a grand day. They’d been boarded overnight in a quaint little cottage that often provided for the boating fraternity. The cottage was not far up a narrow lane from the boat builder's yard of ‘Excalibur Marine’ - specialists in pilot boats, lifeboats and the like, and our three friends were certainly there for something special. It was about eight am and the Sun had risen not much more than an hour before them as they picked up their bags, left the B&B with a cheery farewell and walked side by side down the middle of the empty lane. They passed a few young daffodils braving an early start to life in the Tamarisk hedgerow that leaned into the North East like a time worn and valiant weather vane. This was a rare all expenses paid trip for these volunteers, there to pick up the new offshore lifeboat for their village, a pretty place of safe haven on a rocky coast some 100 nautical miles or so away, north around the peninsular. They laughed and chatted excitedly as they approached the gates and saw their charge out afloat and on a buoy mooring, a bold, brave, bright orange against a green grey sea. The coxswain, Sid, was in his forties but an experienced and talented man of the sea; the crew back home would follow him to hell and back such was their faith in him. Sid had already visited the boat a few times while it was fitted out and had been given extensive training on the latest 'foolproof' technology, it was good stuff .... as long as it was working! She was a powerful little boat and one of a range of innovative self righting vessels which the lifeboat designers were exploring. Sid's skeleton crew, there to take her home, consisted of the second coxswain's son William, and Jim, who was probably in his early seventies, though he probably didn't know for sure himself. William had only been a volunteer for a year or so and was desperate for some experience so as to go out with his father. Though the young lad's name was William, he was known affectionately by the rest of the village crew as Ahab, on account he was an obsessively serious fisherman, always eluded by the big Bass in the bay, and he had a slight limp; a motorcycle mishap legacy. We'll call him Will out of respect. Jim couldn't be more different from Will. Jim had been an active sea going volunteer for over forty years of his life, he'd been on countless rescues, from the ignorant or foolhardy who found themselves tide trapped under cliffs to big freighters in wild storms far out to sea. He'd seen many a boat come and go in the village and with time on his hands and being a highly competent seaman he was invited on the trip as a reward for his unstinting services. Though many would have loved to be chosen for the honour of bringing the new boat home, none begrudged Jim his place, besides some crew had to stay in the village to man their existing operational boat. Jim stirred from somewhere far away in his mind, slowly stood and reached for his bag – too late - young Will had grabbed it along with his own and was already on his way to the open door. The safety boat ploughed a clear white furrow in the calm waters of the bay, sending ripples to the shore like messengers reporting their progress. As they headed out to the mooring, Jim sat quietly at the stern, Will stood like Ben Hur at the bow and Sid chatted with the management rep who was to officially hand over their new lifeboat, the ‘Jocelyn’. “Wow, brilliant handling,” thought Will, as the driver of the RIB safety boat brought her in quick at a shallow angle, changed lock and gave the engine a burst in reverse. 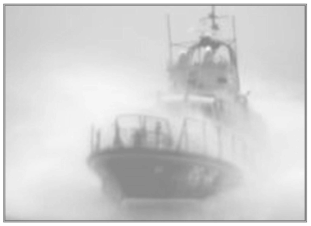 The RIB’s starboard sponson gently kissed the port side of the lifeboat, and everything was still. “Do us a favour lad, secure the RIB by the painter for'ard,” called the safety boat coxswain as he slipped off the 'kill cord' and went aft to tie off too. Old Jim had already done it. “Nice knot,” said the cox, “not many do the waterman's hitch these days .... mostly grannies now”. They both laughed and shared the joke. They all made sure that their gear was secure and ready to take on board, The management rep went first followed by Sid , “blimey”, said Sid as he clambered aboard, “she's got a bit of a roll to her.” “She's passed all the tests and sea trials OK, she only rolls a bit due to the self righting system, once she's under power it's not so bad .... you'll get used to her, just give it time”, reassured the manager. All crew aboard and gear safely stowed, they gathered in the cabin to run the starting checks. Fuel .. OK ... all clear astern, select neutral, power on and start the engines; the engines settled to a quiet hum..... radio OK, power on ... ' coastguard, coastguard this is the lifeboat Jocelyn, special radio test, how do you receive, over?' ... 'loud and clear' came the reply. Meanwhile young Will was being mesmerised by the range of new instruments and dials; the latest version of marine radar had been installed and it even had a little sticker on it saying, ‘In the event of a fault call emergency electrical engineers on 097370600110 or check on line ’ “Cor”, Will thought, “they think of everything”. “Safety boat away!” shouted Will. Sid brought the lifeboat about and headed for the deep channel marker buoys. Just a steady ten knots would do until she, and he, warmed to the task. The bow cleaved cleanly through the greying water and at the stern a straight line of white churned water chased them seaward. They motored, engines purring, to the last marker buoy and beyond, on a bearing South West and in line with the huge granite cliffs some two miles off to starboard. “Stand by!” Sid warned, “moving off at speed”, as he eased the throttles gently forward and the purr of the diesels went from tabby cat to tiger. Slowly she picked up speed and Sid held her at a steady twenty knots. “Aye, Aye Skip”, snapped Will, enjoying the attention that he would not normally be getting and quickly came back with current position and a bearing to give the rocks a wide berth. “Not bad”, said Sid, “not bad but there are other considerations here; not only might we meet different weather conditions but sea conditions too. Powerful currents are at work where oceans meet, sea temperatures can change from the South side to the North. So, to give us a safety margin we’ll take her on this bearing,” so pointing to a scruffy mark on the chart which looked like it had seen fingerprints and pencil many times before. Will corrected the track and course of the lifeboat on the chart in between going outside with binoculars to observe the coast line. They had been motoring for some four hours or so from the boat yard and had already drunk all the tea from their flasks and eaten all the sandwiches and cakes old Mrs O’ Flanan from the B&B had packed for them. “How far now, do you think Will?” tested Sid the Coxswain. “Thanks Will”, said Sid, “we’re going closer inshore now as the shoreline’s getting a touch hazy and just now and then disappears.” Sid altered course to reduce the distance between the ‘Jocelyn’ and the now grey clad cliffs of the mainland. Sid tweaked the volume on the VHF and by habit checked it to the emergency channel. The radio had been silent all trip so far, Sid had been almost tempted to do a second special radio test just in case it wasn’t working it had been so silent. “Can’t help you there”, Sid replied, “the old girl is not yet stocked up with such delights. . . you’ll have to wait till we get home and so saying Sid eased the throttles forward a bit more; radar or not he didn’t want to be caught out in some nautical pea soup. It was sudden; like a monster from the deep the thick mist rose from the sea and following the coast by eye ceased to be an option, visibility was around two hundred yards but changeable. Sid reduced speed and called Will back to the charts, Off a relentlessly hostile coastline it was now even more imperative to keep track of their position. Unable to resuscitate the boat’s ‘Dodo’, Sid turned his attention to the chart and tide tables, making urgent notes on times and possible distance covered. “Blast it all, Jim, I relied too much on that new fangled electric stuff, now we’re not sure of our exact position. We need to be far enough off the coast to miss this headland”, Sid said, indicating with the pencil to Highmoors Point. “Can’t help you with this one Sid, I’m just a simple deck hand. . . but I can tell you this though, we’ll not hear any surf at all through this fog”. They motored on steadily through the fog seeing nothing else but the boat’s foredeck through the glass screen, Sid trying not to show his own grave concerns to the others for the situation into which fate had carried them. Sid reached over the console and depressed the switch for an automated fog warning signal just in case other vessels were in the vicinity, “keep your young ears open for incoming sounds Will”; the bell rang loud and clear then silent, leaving Will wondering if after that he would even hear another vessel approaching. Sid later took over at the wheel and called the others to him to discuss their dilemma, “right lads, it’s like this, we’re not sure of our position and as such we daren’t take a bearing for home. We can continue on this bearing for some while, reduce speed, save fuel and hope that the fog lifts, beyond that I’m open to your ideas. Will started to speak and Jim went to quiet him but Sid interjected, “it’s ok Jim, let him have his say, we’re all in this together and I’m only sorry I didn’t spend more time with the charts and we’d not be in this pickle”. The Jocelyn steadfastly cleaved her way through a backlit grey cloak that enveloped sea, sky and her deck with the same eerie silence. A silence that even threatened to muffle the relentless purr of the diesels. . . the warning bell sent out it’s foreboding message to any who could hear and the crew sent their thoughts out there with it. Jim was at the wheel, his old eyes still good enough to read compass and speed, young Will was on deck and Sid monitored the depth gauge as he kept his moving finger on their supposed position on the chart, “steady at 14 metres now Jim . . . . wait. . . that’s it. . . thirty metres, we’ve hit the shelf line with luck. Drop to four knots and hard to starboard . . . we’ll see if we can pick up the shelf line again”. Sid’s worries eased a little, as it looked like their plan could work. Sure enough, they gently followed the shelf line North East, occasionally having to ease a little to port or starboard to confirm their position. As Will joined them in the cabin, Jocelyn crossed the East South East line. “All stop, Jim”, said Sid, “let’s take a moment to set our position and take a bearing”. As the Jocelyn ceased to make way she was rocked lightly by the gentle waves, as would a mother with her child. “Feel the sea breathing Will? Asked Jim, “the bay can be compass as well as larder you know Will, the direction of the waves on such a day as this is as good as eastward bound as you’ll find; you’ll never know when the old stuff can come in handy”, Jim said, nodding with a smile towards the defunct radar unit. Thinning it was not and it clad them all as if in a damp grey coat. They stood a moment, as men of the sea, adjusting to the roll of the deck, listening into the unseen distance, but most of all sensing the essence of their lives and the dangers they were prepared to embrace, they sensed a peace and a knowing of courage and pride that they could share together, those men of the sea. “Right lads,” back to work, Will, stay on the foredeck, Jim, inside with me, contact coastguard and let them know we have a confirmed position on the chart and on a bearing for home and tea. . . miss the bit about tea out. . . no assistance required at this time”. Speed, time, tidal current and state checked and it was three happier men that set off for harbour with Sid now back at the wheel. The fog was easing a little as sea fogs do, for they often have a patchy existence. Sid smiled and nodded, it was a grand day now for different reasons. As they idled their way on slack water to their mooring the fog lifted a little as though giving up on trying to beat them; at the mooring they were met by the station’s little ferry RIB, its two man crew full of energy to help. 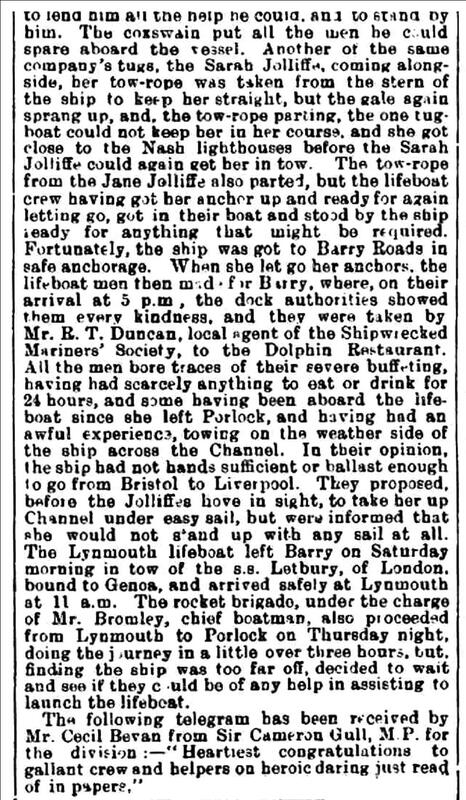 The Jocelyn was secured and shut down to await repairs. The RIB crossed the water with a hint of sunshine lighting the land and boathouse in front. It was a joyous reunion full of questions and answers. . . the coxswain of the ferry RIB informed Sid and his happy crew that the coastguard had kept them informed and that their arrival was anticipated. Not the band and cheering crowds, no, they had long gone home, but a lot of friends at the boat house, hot soup, and hot food too was to be their welcoming party. “Hot pasty, chips and beans,” for me said Will. “On such a grand day as this,” said Sid, “you can have anything you like, we’ll see to that.” “Grand indeed and we live to see another one,” old Jim laughed. Perhaps one day we will read of the Jocelyn’s exploits. . . perhaps one day. A golden age of sail. No one would have called it suitably fine weather that Sunday morning as David, a plumpish business man in his early forties, said goodbye to his wife and prepared to go wind surfing on a nearby reservoir. “You're being silly dear, you're too old to do this sort of thing, and it will be turning even colder later today. . . you shouldn't go on your own either . . . “ . . .
David stopped his wife 'nagging' him further, “look love, I used to do this every weekend when I was in my twenties, the old skills will still be there, don't be a killjoy, just let me go and try it out, if it makes you feel better, as soon as I get cold or tired I'll come straight home, Okay?, interrupted a confident David. He was always supremely confident, that's how he'd ended up years earlier behind the boss's desk at 'Nimrod Financial Advisories Ltd', not that he saw it as limited as he always believed you could achieve anything you wanted, if you wanted it at all; a belief that would be sorely tested later that day. His wife, a pleasant, quiet lady called Becky, or Rebecca as David called her, had always stood in his shadow, though she in fact was many times the wiser of the two. Becky took her children out to wave goodbye and to wish their father a safe journey; David was almost too busy brushing cobwebs off his windsurfing board in the garage to notice. He threw his wet suit in the boot, checked the roof rack lashings were sound, hopped into the BMW Estate and with a cursory wave and his mind full of how good he used to be as a windsurfer he turned right out of the driveway and was soon gone from sight. It was about eight miles to the reservoir. In general, private motor boating was not allowed but there were often sailing craft and wind surfers out there. Not so today, David could see a couple of sails about a mile down wind from where he'd parked, otherwise it all looked deserted. David sat under the open boot lid and struggled to don his old wet suit, it was more like a wrestling match than anything else but he managed in the end. Walking wasn't easy either, as the suit had constrained his muscles (and his fat) but again it was tolerable. He happily carried the board and sail down to the water's edge. There was so much that David had forgotten, like how incredibly slippery algae could be on lake side stones and concrete; a fact upon which he reflected painfully from his uninvited and most undignified sitting position. Cold water seeped into his suit around his legs and backside; a discomfort that in the old days was obliterated by the joy of youthful adventure and the call of the wild. . . now it felt more like the call of nature! “Come on David, don’t give up now,” he encouraged himself as he cautiously and with significant difficulty stood up. Meanwhile, a part of him secretly wouldn't have minded waiting in a warm village pub for a while before retuning home. He couldn't be seen as a failure in front of his wife and children. “No”, he dismissed the thought, “it will all be okay once I'm on the water.” So saying, he pushed the board out and took his wobbling place on deck, awkwardly pulling the sail up from a floundering crouch into a more or less acceptable but ape like posture. It was fairly sheltered where he had launched, the easterly wind being deflected somewhat by the reservoir dam wall. It actually wasn't too bad, keeping his balance was reasonable and he managed to go back and forth in line with the dam wall for a couple of hundred metres or so. Even the turns were okay. . . not as sharp as when he was younger but they still pleased him. If there were any problems with his body and fitness they were obscured by his spirit which was bathing in the reflected glory of the memory of youth. To him this was joyous, what life was all about, real living, real life, he could do this forever, why had he ever stopped?. . . to anyone watching him though it was just a portly old guy in the shallows trying to look like a real wind surfer. Time meant nothing to David, the challenge of a reclaimed youth was all, and he set out downwind to test himself, his mind infatuated with the power of youth he’d forgotten was gone, long gone. Meanwhile at the other end of the reservoir some two and a half miles away another family were putting themselves to the test. 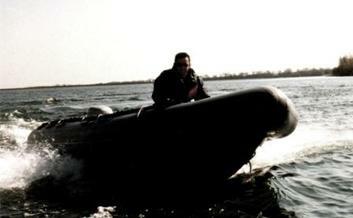 This time it was in an inflatable boat with outboard motor. Their father had arranged permission to use the water to teach his children about boating skills. He used to volunteer part time at the outdoor training centre as a power boat instructor and was quite familiar with the lake and its peculiarities. His children, Andy and Kes were 14 and 8 respectively, neither had any boating knowledge and no wet suits, none of them had, but they did wear buoyancy aids. . . you could die in this lake, and in the more distant past people had too! The easterly wind had shaken the lake surface to a rough cold grey with white horses beginning to show themselves more frequently. The forecast gave no mention of rain, only a deepening cold as the wind strengthened. They should be fine, they had warm clothes, woollen hats and a few snacks in a bag secured to one of the metal ‘D’ rings inside the boat. Andy and Kes sat where they had been told, on the floor at the front of the boat, and they both held on to the thin white rope that ran along the sides of the sponsons, (the inflated tubes that give the boat buoyancy as well as structure). “What we’ll do is cross the lake to the other side, there are some sheltered bays there and we can change around and let you both have a go at some simple manoeuvres. . . see the church spire in the distance? And that little group of trees? We’ll aim for a line between them and we should find the first of three bays we can explore. So that we don’t get buffeted by the waves too much on the exposed part of our crossing we’ll run the boat along the waves and not into them. . . it’s an old trick to make the journey smoother. . . and drier too,” he laughed. The children smiled back then looked forward to get the church and trees in their sights. This was such fun, so exciting and what a story to tell their friends at school. How lucky they were to have their father take them out like this. “Look dad,” shouted Andy excitedly, pointing into the wind, “a wind surfer. . . wow look at that, I want to be one when I’m older.” “Yes, exciting stuff that, but I think I still prefer what we have here; I’m surprised he’s out this far and what with no safety boat cover on the lake today; he’s taking a chance. He must be very good or very confident . . . or both to be right out there where he is. Anyway, never mind him Andy, let’s concentrate on what we’re doing, it’s no game; it’s a serious business driving a boat with passengers. We must watch the water in front; you never know what is half floating out here that could cause us trouble.” “What like dad?” asked Kes. “Well we don’t want to run over any bits of rope or into tree trunks and the like, all of which can be found in the lake from time to time. . . we’ll be fine, but we must still be vigilant. . . that means keep our eyes open all the time,” he answered, thinking about how the local yacht club rescue boat had once crested a wave too late to see a fallen wind surfer in the trough. They couldn’t miss him . . . he kept his thoughts to himself. There was much he kept to himself, his children would never know, nor ask. “They’ll find enough of their own hardships in life,” he thought, and then his eyes were back on guiding the boat along the waves and towards the distant bay. As they motored steadily on into even deeper water, some thirty fathoms deep, the water took on an alluringly green grey hue and the waves became higher, deeper and almost mesmerising, inviting even! Sometimes at the peak of a wave a green light shone prettily through it before being devoured by one of the many white horses roaming the lake. The line and travel of the waves meant that they had to correct their course frequently by crossing over a few and almost broadside on. Andy seemed to relish the steep roll from right to left and rise and fall of the boat yet Kes looked a little worried and clung more tightly to the sponson rope, “Don’t worry,” her dad comforted, “these boats are sound as a bell especially at this level of weather. In really bad weather and if we put all our weight on one side then it might be different and at the crest of a wave the wind might just flip her over. We will never bring the boat out in such conditions and of course we know how to balance the load, don’t we?” An exchange of smiles signified an understanding. . . it became a happy adventure once more. “Okay, hold tight now, we’re going up on the plane. . . it means we’re going fast enough for the boat to lift more out of the water. . . it’s quicker and saves fuel too,” he added. So saying he opened the throttle and the front of the boat at first lifted quite high then slowly levelled off as the boat increased in speed. “About twenty knots”, he shouted above the wind and noise, “about twenty. . . isn’t this great?” The children were kneeling, holding tight and looking forward, eyes squinting into the spray that occasionally threw itself at them from the breaking waves. . . and those little white horses. Every now and then the children were buffeted airborne by a wave and bounced down on their knees as the boat dropped harder into a deeper trough. They looked at each other and grinned, their faces screwed up as more spray launched itself at them from the deep. “Thank goodness for warm clothes and waterproofs,” their dad thought, “otherwise we’d be on our way back to a warm home by now.” It was a great day, the feel of wind and spray, the children enjoying themselves. . . he smiled and his eyes returned to the horizon again. . . “nearly there,” he thought. Once in the safety of the bay, he instructed Andy on how to drop the anchor, “count the arm lengths to when the anchor line goes slack Andy. Then we’ll go down wind about three times that and set the anchor.” He couldn’t believe how well it went, it was a dream come true, often the anchor would not set in the bay, today it was perfect, almost beyond reality. “A good omen,” he thought, “a good omen.” Even landlubbers have their superstitions. Having anchored, he switched off the engine and they had a talk about who would do what and who would go first. “What happens if the engine stops, dad?” asked Kes. “Yeah, what happens if you can’t start it again?” added Andy. He said nothing but pointed at the two paddles strapped to the inside of the sponsons. “What? Them?, questioned an astonished Kes. “Come on kids, let’s give it a try, two to paddle and one to gather in the anchor line . . . bags I do the anchor line!” He smiled and so doing passed them a paddle each. It didn’t take them long at all to realise they weren’t going anywhere fast, in fact not going anywhere at all. “The boat’s too heavy dad, we can’t paddle into this wind. . . they’re useless, why are they here?, gasped Andy. He shook himself out of these feelings and managed with an element of sincerity and excitement to set the next tasks, “Right, take turns – remember the kill chord and who is in charge, do forward figure of eights then reverse figure of eight. Show that you have complete control of the boat and crew and then we’ll go ashore and have our picnic”. What a surreally wonderful day they were having, all was going well, colours were bright, the air felt good and it was not long before they ran the boat into the shallows, secured it with a short anchor line and were about to eat. “Watch that your hands are clean, or at least don’t touch the food, the algae in the lake are not safe and we must be aware of a nasty disease sometimes left by our friend Ratty along the shore. We’ll be okay if we’re sensible”, he said, watching them carefully. “Come on then clever clogs, let’s make up our gear, stow it ship shape and if you’re really good you can take it in turns crossing the lake for home, “so saying, he collected any rubbish and placed it in a rucksack. It was truly a magical day, the like of which he never thought was possible. His crew were brilliant, he was proud of them. This day was becoming a dream made true for him. Kes was to take the first ‘shift’, her face taut with concentration as she fought to make the boat go where she wanted and the waves and increasing wind strength did their best to stop her. Her father let her stick at it as he could see she was slowly mastering the skills and she needed the confidence this would give her. They were about a third of the way across when Andy, who had eyes all over the lake, spotted the windsurfer again. “Hey dad, the windsurfer is down that way now and is waving to us, can we go and say hello?” Andy called. It was obvious to their father that the surfer wasn’t waving hello but was giving a feeble attempt at a recognised distress signal, “ Right Andy, do not take your eyes off him, in fact point to where he is and keep doing it, no matter where the boat goes watch the surfer, got it? Kes, quickly into neutral and swap places with me, I’ll tell you what to do as we get nearer, Okay? You have done well.” Andy kept his eye on the surfer, though quite often a wave would hide him from view. Their father took the boat down wind and well away from the surfer, “you’re going the wrong way dad, he’s over there”, shouted Andy. “Don’t worry Andy it is how we must do it to do it right, just keep watching him all the time.” Having gone down wind of the surfer he turned the boat to line up with the ‘casualty’ and headed direct into the wind; at slow speed the boat began to take more spray on board from the breaking waves. At last they came alongside and he slipped the engine into neutral, fouling the propeller on any loose rigging was the last thing they needed, an ashen faced and exhausted David was clinging to the board with one arm and weakly waving with his other “Andy, help the gentleman to find the sponson rope and tell him to hold on as best he can while we organise how to get him on board. “Tell him everything will be alright.” Inwardly he knew everything was not alright, this was a big chap in the water and by the looks of it had no strength left in him of his own. . . he would be a dead weight that even he couldn’t get on board, never mind his children do it. . . . the proverbial nightmare. Prevailing conditions in the lake were deteriorating quickly, the waves becoming more frequent and the tops breaking easier, the wind was cruelly cold on wet hands. “What’s your name?” he shouted to the surfer. “He says it’s David, dad,” called back Andy. “Okay David,” he shouted clearly, “stay with us, keep hanging on to the boat where you are, I’m just going to move us away from your rigging, then we’ll get you safely on board, alright? Hang on tight as you can, won’t be long”. Checking the engine looked clear of floating debris he slipped it into gear and manoeuvred gently away from the board and put David downwind of the boat to give him some shelter. “keep on the other side kids, balance the boat so we don’t tip”, he cursed under his breath hoping he hadn’t frightened them but needs must, this was going to be dangerous all the way. David was in quite a bad way, exhaustion and probably the onset of hypothermia but he grasped at the chance for rescue and life; he was in a dark place like he’d never known before. It went well, it was quite strange that despite all the noise there seemed a strange silence, as if the elements were hushed and quietly watching with fascination the events unfolding in their midst. With the engine in neutral and the starboard rear sponson deflated the boat was at the mercy of the free spirited elements that sought to pitch and roll the boat interminably; the boat was filling with cold water as quickly as fear flooded the minds of the children. 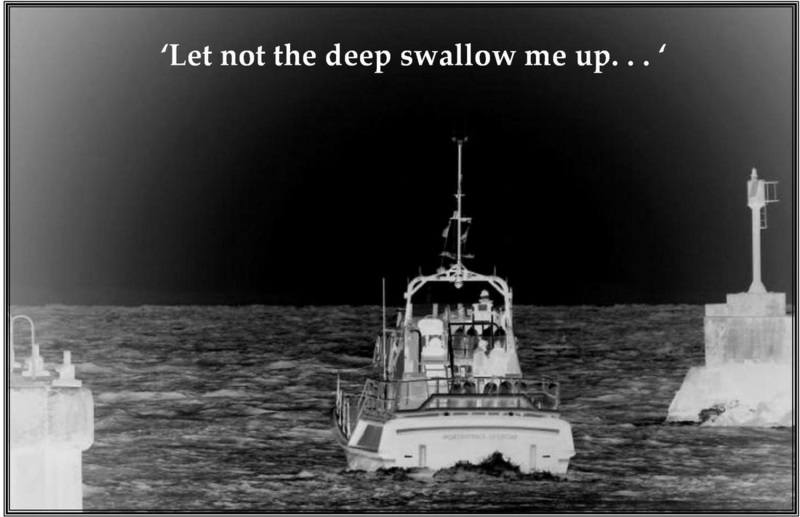 . . he took a firm grip of David’s wrists and heaved him into the boat through the deflated side. He could see that all the fight for life had drained David nearly of that life itself and now he thought he had been rescued David was beginning to stop fighting for his life. . . and he wasn’t safe yet, not by a long way, he shouted at David and snapped him out of his surrender, “David, get forward, get forward and stay down. . . out of the wind. Andy, you come here and hold this sponson up as best you can. . . just do your best. . . what ever you can. . . Kes, find some chocolate bars or something in the rucksack and you’ll find a ‘space blanket’. . . silvery thin plastic thing . . in the front pocket. . . give them to David then, if you possibly can at all, bail some of the water out with that canvas bucket. . . and now we’re going home.” David, whose fingers had ceased to work with any dexterity some while ago couldn’t open the wrappers, Kes quickly did it for him, it was a strange juxtaposition of the child adult relationship, but David was grateful. He held the chocolate bar in both hands. Within ten minutes though he was beginning to recover and feel a little better and could speak a little more clearly, “been there for hours,” he said, “ thought I was going to die out there. . . I came too far down wind and couldn’t get back, then I fell off a few times. . . at the beginning I could get back on the board . . . then I just got too tired to do it anymore. . . “His voice trailed off and David simply stared blankly into the sky, his mind at work but his eyes not. Kes continued to bail, even though it was such hard work, every bit of a bucketful that went back over the side made her feel safer. . . she was happily oblivious of it coming back in behind her! “Well, David is truly knackered,” he thought, “poor old chap, must have been hell out there.” The boat laboured on slow but sure towards the jetty, “I’ll phone the centre later and let them know about the boat and the loose sail board,” he said aloud, but nobody was listening, everyone was lost in the depths of their own thoughts, as deep as the hungry green waters below them. Jetty reached and painter secured, he switched off the engine and removed the kill cord. His children were helped ashore first. “Andy, just hold the stern of the boat close to the jetty while I help David out,” he said with relief in his mind. It was nearly over. Soon it would be another day and this one would be over. What with a tired cold body and the restrictions of his undersized wet suit David floundered on to the jetty. . . “like a beached whale,” he said. They shared the image and the joke – it was a good sign that David was on the mend and warming up a bit. That’s what they did. David started his engine to get it warmed up, then, out of sight of the family managed to peel off his wet suit and with difficulty put his dry clothes back on his damp and wrinkled body. They didn’t fit well but they still felt good. . . dry and comforting they were. The family followed David home. . . to be sure he was okay. On arrival a worried Becky had to be placated by them all. Even Andy chipped in and said how marvellous David had looked when first seen and that he, Andy, wanted to be like that when he grew up. After some happy and cheering goodbyes from David’s family he drove his own children home. As he dropped them off he was treated to a few angry words from their irate mother and the assurance that he wouldn’t be taking them out like that again. He mentally compared his reception with that happier one at David and Becky’s home; he sighed a resigned sigh. . . sometimes that’s just the way life is; the path we take is our own choice. We’ll never know if it was summer pollen or a small tear that joined with his soul listening, as though lost in time, to a soft slumbering song by Enya playing on the car radio, a beautiful song all about dreams, the night and stars. . .
Only night will ever know why the heavens never show, all the dreams there are to know’ . . .
‘night has brought to those who sleep only dreams they cannot keep’. Way back in 1899, after hauling the Lynmouth lifeboat Louisa to Porlock Weir, those not part of her crew returned to Lynmouth with her launching carriage. Now the urgency to save lives was replaced by their wish to go home. On the night of 15th November 2016, I decided to walk that tormenting path myself. There was something out there I needed to know. In 1899, Jack Crocombe had his plan and in 2016 so did I and there the similarity ends. However, one aspect remains true of any journey over the moors, if you weaken and falter by the wayside then chances are, you will die out there. A bit melodramatic? Well that’s what I went to find out. At some point, determination becomes desperation and previously noble dreams turn to anxious prayers of hope; it is what you do at this juncture that will decide your fate. The moon rising over Porlock Bay bid me time to leave. I’d had a hot meal in one of the hostelries and thought on those who braved that January night back in 1899. How many had eaten well that day, how many were hungry from the start? Indeed, how many had said their goodbyes before they left? How many had fine boots to wear, boots good enough for the mud and stones of their path? I thought on those whose boots may have been needing repair, thin soled and leaking. My own boots were good, waterproof and comfortable but by the time I’d climbed to the summit, my feet were calling out to me in misery, as must have theirs. To avoid being run over by modern man in his motor car and prematurely killed on the main Porlock hill, I chose the toll road, which as it turns out, is further, adding a mile to my journey and compensating for my early stop at the Blue Ball Inn at Countisbury. On reaching that Porlock summit, some five miles in the waiting, I sat by the roadside, where Culbone stables once stood. (Now a pub, but closed for refurbishment the night I was passing). By the light of the moon I changed my abrasive newly purchased socks for softer more comforting ones. Once more, I thought of those brave men in 1899, tortured by stormy January weather and who had neither such an opportunity nor luxury. It is a fantasy to think the moor is flat between the two giants of Porlock and Countisbury, undulating, I’d accept. But for tired legs and blistered feet, every slope is a challenge; a challenge to be met . . . and overcome. You cannot give up; there is no one but yourself to turn to for help – you are the help. What are you to do? Stop by the wayside and wait the inevitable weakening by hypothermia - or plod on, one painful step in front of the next. Though I was blessed by a full moon and clear skies, the returning villager’s way was shrouded in the total darkness of a new moon, with only oil lamps to find the road. . . when tiny flames weren’t being blown out by the gale. There comes a point in any journey that it becomes less arduous to continue forward than go back, regardless of the difficulties. Whether taking Louisa from, or the carriage back, on the narrow track to Lynmouth, there was little opportunity nor appetite for turning back, they must succeed. For me, I could ask at a farm house to phone a taxi and take me to a hotel. But who in life enjoys failure? Pride should always be tempered with practicality and shame belongs, not in failure, but in not always doing your best. As would have they, I kept a lookout in the distance for any welcoming light. Eventually I saw one . . . but my heart sank, for it was a long, long way off and I was beginning to have doubts how much I had left in me – body and spirit alike. As fortune would have it, the lights were from Lynton and my own destination, the Blue Ball Inn, was much nearer, though still hidden on the far side of yet another unwelcome ‘undulation’. Finally as I launched my aching body into my car, my journey now over, I thought on those soaked and aching heroes who launched Louisa over the leg breaking pebbles of Porlock Weir beach, into a storm laden sea. Their journey was not over – it had only just begun, the next day, tired, torn clothing, injured or not, they must work to make a living; their struggle never over, never forgotten. Of fishes and mermaids that play down below. The blue of the sky and mountains so green. Then they disappear and are out of reach. Not living free as sea horses can. Like a piece of sea foam or the wild white mist. Combe Haven, a fishing village on England’s Atlantic coast. Gulls were strangely silent. Tom stood motionless at the end of the quay, spellbound as the changing sky began its story. A weathered hand patted his shoulder and disturbed his dreaming. Turning slowly, he shared a knowing smile and a greeting with William, his lifelong friend. ‘Pity,’ Tom muttered, for fishing was their livelihood. Walking back along the quayside, towards the boats beached between tides, they met others near the harbour steps, all eyes fixed towards the horizon. Tom and William turned to look. A gust of wind flapped their collars, voices fading as the wind howled in their ears. There, far out to sea on a northerly tack, were sails. For a while, a squall hid the ship from view. ‘She's closer inshore already Tom, I can’t say I like the look of that; not at all,’ his voice uneasy. Tom nodded thoughtfully; he knew this stretch of coastline well, all from hard won experience. Together they watched a while longer, until a new bitterness in the wind and the threat of heavy rain drove them away to find shelter. Aboard the ketch, Ebenezer, Captain Sam Harvey faced a terrible dilemma with the ship’s elderly and belligerent owner, John Lightfoot Esq., and his family. Intended to be a treat from the owner for his grandchildren, all were now sick with sea and fear. None had expected such terrifying weather. Had he not been ordered otherwise by the owner, shamefully ignorant of the sea, the captain would have sailed far from shore and waited out the storm. His other choice was to find an anchorage in a sheltered bay along the coast, yet on this rocky sea shore safe harbours were few. He’d already passed Combe Haven, off the starboard beam before the wind had noticeably strengthened. Studying the charts he found a bay whose southern edge would give shelter. Influenced by an anxious and dictatorial owner, the Captain gave orders to sail for Yenisbury Bay. Being a bay with no safe beach, their anchor must hold. The crew set to, making way for the line of white water which separated sea from cliff. Once past the point of no return, the bay became their abiding hope while the wind strengthened and drove them shoreward towards a coastline never shy of inviting death. At Combe Haven, Tom chopped logs at his cottage, readying the winter's wood store. His wife Elizabeth was preparing food in the kitchen. When the wind began to bend the trees and the roof tiles started to rattle, Tom walked through the house, picking up his coat. Elizabeth said nothing for she knew where he was going. The same place he always went when the weather was bad. ‘Not to worry,’ she thought, ‘he’ll be back for lunch.’ Cloth cap tight on his head, and collar up, Tom strode purposefully through the narrow village street, his fisherman's boots strangely quiet on the tanned stone cobbles. When he arrived at the boathouse he found the rear door already open. He approached slowly to stand in the doorway. He heard voices and stopped to listen. A change of mood swept away all pleasantries. On board the half wrecked ketch in Yenisbury Bay, the sailors sensed their fate. They were realistic about any chance of survival where a pounding sea met jagged rocks. Death might reach out its unwelcome hand and touch them at any minute and the creaking of ship's timbers and flapping of tattered sails had long driven terror into the poor children’s hearts. Callie-Marie’s crew and helpers rallied their strength and launched into a sea of wild white horses driven ashore under a menacing sky. Tom had picked his strongest crew well and, as he called upon them to pull together, he deftly steered them beyond the worst of the inshore waves. On board the ketch, a watery grave might still beckon but Captain Sam Harvey continued to reassure his passengers that all would be well. He could only hope that their end would come quick and clean, though a yearning for salvation would haunt them all to the very end. If the ketch survived intact, she might be stranded by the outgoing tide. Then they might all walk along the shore line to safety. But, such a hope was like the drowning man clinging to straws. The 'Ebenezer' was unlikely to last until the tide had ebbed. As for our valiant lifeboat, now some distance from shore, many a time, wind and wave contrived to capsize her as the storm met her beam on. Yet the skill of the coxswain and the strength of her crew prevailed again and again. It was more than two miles to Yenisbury Bay with the storm pushing them ever closer to the sea cliffs that rise a thousand feet. ‘Set the for'ard sail, we'll take advantage of this wind where we can.’ Two men raised the mast and set the sail, an astonishing feat as the small boat was buffeted mercilessly by the elements. Spray stung their hands and faces; their clothes were soaked in sweat. Water swilled about their feet as the self balers struggled to keep up. ‘There she is! I see her, off the starboard quarter. Take courage lads and save something for the journey home,’ shouted Tom, steering with one hand and pointing with another. As the lifeboat edged ever closer, Tom made his plan. 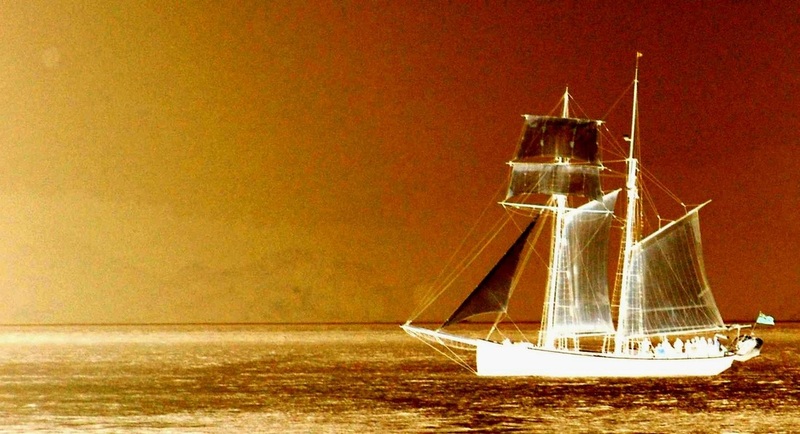 The Ebenezer was indeed dis-masted, sails shredded and rigging a tangled mess in the foam. She was pinned to the rocks by the wind and the rising tide. However, Tom could see a little slack water by her bows. ‘That's where we'll take them off,’ he thought, calling for the sail to be lowered and mast stowed. ‘Put up a flare Jack, let them know we are here.’ With all the skill of a master mariner, Tom picked his spot to turn, anchor and line up, drifting Callie-Marie stern first towards the ketch. From the stern rail of the Ebenezer, Captain Harvey and his first mate watched intently through spray stung eyes as the lifeboat crew reduced oars and paid out the anchor line. It seemed to take forever, as though time itself had stopped to watch. Once at anchor and no longer making way, the Callie-Marie pitched and rolled with every wave. Tom pointed to the bows of the Ebenezer with outstretched arm. As of one mind, Captain and mate made their way forward, gathering the crew as they went. Captain Harvey shouted into the cabin, ‘Be of good cheer sir, we may yet be saved. . . lifeboat coming. Stay below, not safe yet. . ‘. Captain Harvey's crew set about with renewed vigour to secure the throwing line and, despite numbed hands, the knots were tied with skill, ‘All secure Cap'n, all secure.’ Captain Harvey immediately ordered a rope ladder over the side. Choosing was not so much a hardship for Tom; he'd had to do it many a time before. Tom surveyed the pleading eyes of the crew; no one wants to die, not like this. He chose six strong sailors who could help his own crew with rowing, and the woman with her three terrified young children but the elderly gentleman looked like he'd seen most of his days already and his survival was questionable. ‘Right Sam, put the chosen men on board the Callie-Marie then we'll help the woman and children aboard ourselves. While the waves battered the creaking ketch steadily towards her inevitable surrender and hanging with one arm from the rope ladder, Tom lowered the three children one by one to the waiting arms of his crew. Their mother was already weakened by her ordeal and as the lifeboat rose and fell, the frightened children watched in horror as she lost her grip on the swaying ladder. Tom reached out and caught her with an almost super human effort. She was helped aboard to sit centre of Callie-Marie with her children huddled around her. It wasn't without a price to pay, Tom had felt something tear in his shoulder, and it wasn't his coat. He was in pain already as his crew pulled him strongly towards them and into relative safety. Certainly Tom didn't want a fuss; his crew looked to him for leadership as well as seamanship. He would just have to steer with one arm, that's all. Slowly but surely, the Callie-Marie made progress, anchor aboard, they were at last heading for home. Tom looked southwards towards Combe Haven but all he saw was white water and spray. It seemed, row and die or stay and die, though such men gave up only when their hearts had stopped beating. Meeting the wind head on, the lifeboat crew pulled hard on the oars in silent unison, the mark of a disciplined crew. Adrenalin gradually drained from Tom’s body, replaced by pain in his damaged shoulder. Steeling himself, he braced his body against the tiller and set his eyes on a course for home. Against rising waves and blinding spindrift Tom guided his gallant crew, reading the waves and seeking every advantage. The crew, with backs to a hungry sea, timed their stroke with the man in front and listened for their coxswain’s orders. They’d already lost sight of the Ebenezer and only home filled their thoughts. Blistered hands hauled away at heavy oars while death hunted them close by in the deep. When a man began to tire and a chance came, Tom changed him for one of the sailors he’d rescued. An unwarranted sense of guilt always made the crew reluctant to give up their place, ashamed to meet the eyes of their comrades. Then, once at rest, sweat and sea water cooled quickly and brought a shiver to their bones. Little by little, the Callie-Marie and her precious cargo made progress against wind and tide. A remarkable feat of strength and courage, few would have thought it possible. Yet another half hour and Combe Haven was just visible. Now was not the time to relax, now was the time to redouble efforts. Whatever the cost, there must be no mistakes. ‘Land ho, off port quarter. . . home in sight,’ Tom cried. The news lifted the crew’s spirits, renewing their strength. Combe Haven lookouts had already seen the coloured speck appearing and disappearing in the distant waves. Willing villagers prepared to receive the boat and crew into harbour and the boat house was ready with blankets, dry clothes and food. Finally, Callie-Marie was rowed safely into the relative calm of the harbour to welcoming shouts from the villagers. Safe home and on dry land, the relief of the crew was immense. The deep had failed to claim them, this time. Fresh volunteers secured Callie-Marie to the quayside, while the rescued mother and her children were comforted in the boat house. Tom, however, was already planning the next mission. . . his clear orders calling for replacement oars and an additional anchor and line. As the exhausted crew dragged themselves off to the boathouse, fresh legged volunteers busied themselves with returning the lifeboat to sea readiness. Tom disguised his pain and also made his way to the boathouse. He sensed he was the only one who might make the repeat journey with a chance of success; lives depended on him and his leadership. David nodded with a sense of pride in his heart that he was now among the chosen, picked up a life vest and joined the others on the quayside. Tom caught the worried look in William’s eyes; David was his one and only nephew. Perhaps Tom was pinning his hopes on the weather abating and making life easier, for he’d picked his strongest crew for the first run and now look at them . . . keen in spirit but drained in body. Once again he called the crew to action as the lifeboat cleared the calm water and met the wild sea, ‘Oars together now. . . pull men, pull.’ Soon she was lost from sight in the spray, somewhere out there on the deep. Of those left ashore, some went to work or home to rest, others stayed at the boat house, those that did, cheered themselves with the success of such an amazing rescue. While they eagerly awaited the lookout’s cry that the Callie-Marie was homeward bound again, as of one mind they praised the strength of their fine boat and the men who served. After two or maybe more anxious hours, hoof beats of a farm horse clattered on the cobbles outside the boathouse. William stood and in silence, walked outside. . .
Now I must tell you, we have already stayed too long. It’s time we left the villagers of Combe Haven to their own fate, whatever that may be. On 12th September 1878, young David Trescothick received a silver medal for gallantry. He never missed another shout and, on Tom’s retirement, took over the role of Coxswain. None were more proud than his uncle William. The lifeboat station was closed in 1926 but his medal remains on display in the small village museum.